Ahh time is here. Rhonda Shear comes to your rescue with one of her best-selling bra sets. In colors that last seasons and a fabrication that's built to bring you instant comfort ... why not stock up while you have the chance. They are ahhh-mazing. I shared these with my family and they love them too. Great, great product. True to size, fabric smooth and hugs figure, not tight and I can wear all day without discomfort. Washes well, no shrinkage. soooo comfy. My weekends are spent in these. These are the most comfortable bras I have ever worn. I have several and wear them all the time. I like wearing two at a time sometimes, when I feel I need more support and/or coverage; its fun to mix the colors, doing tone on tone or complete opposites. And the best thing - the price! Love these bras! 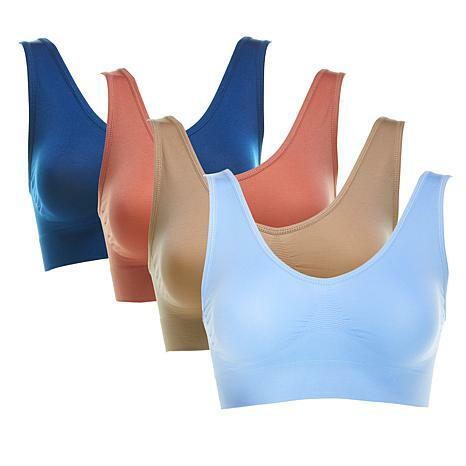 This bra is comfortable to wear and supports well.